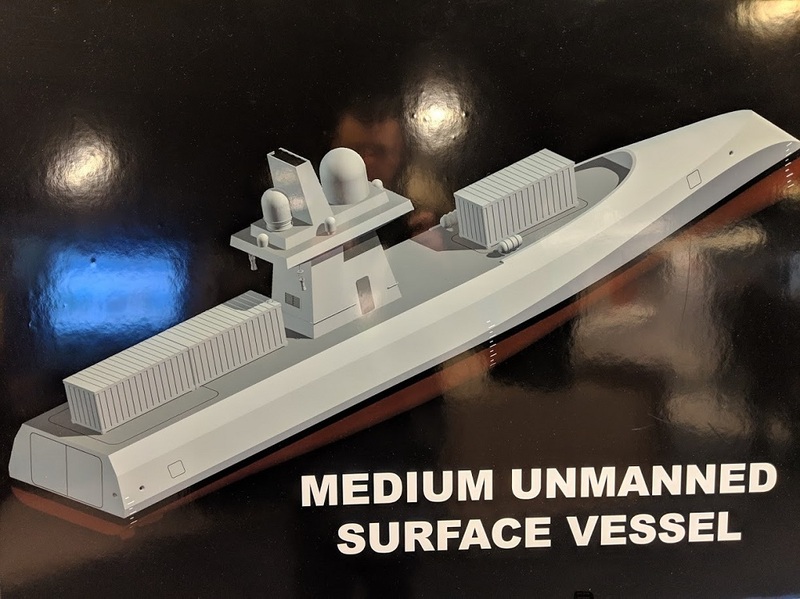 Medium Size USV Design Concept on display on Atlas North America stand during SNA 2019. Naval News picture. 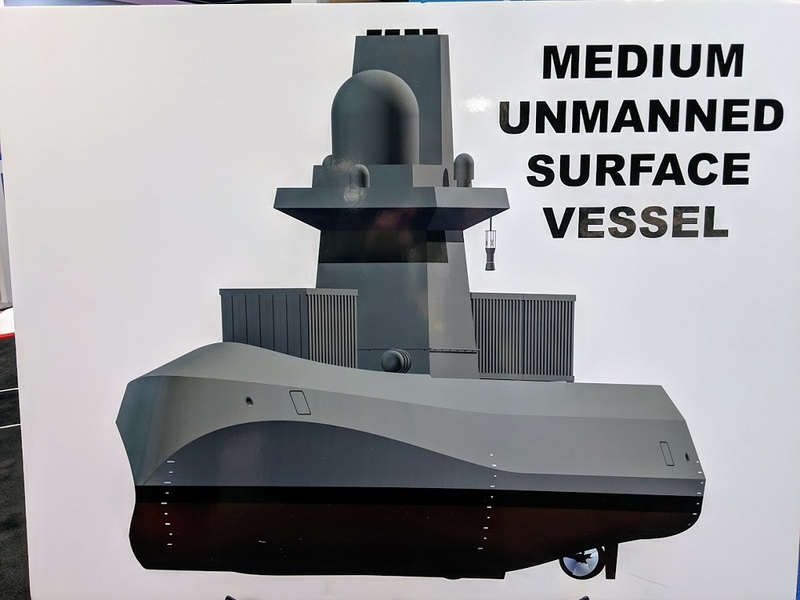 Atlas North America unveiled the conceptual design of a Medium Unmanned Surface Vessel (USV) during the 2019 National Symposium of the Surface Navy Association (SNA). Atlas North America is a company of Germany’s Atlas Electronik Group. Talking to Naval News during SNA 2019, Mark Rios, Atlas North America’s Business Development & Sales Director , explained that the medium USV design is about 50 meters in length with a displacement of 1,500 to 2,000 tons. 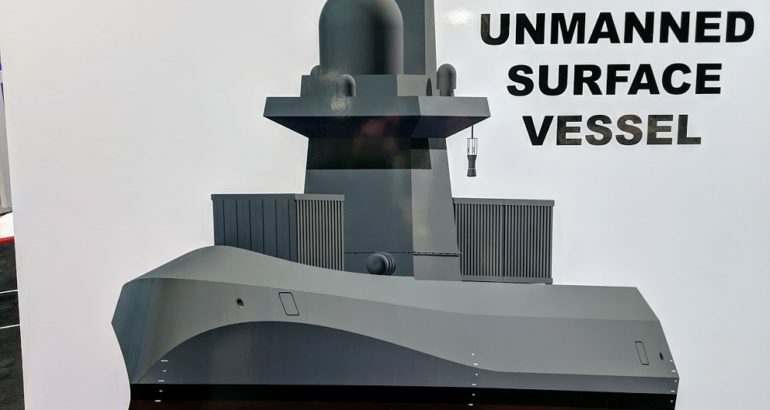 The vessel’s design features an inverted bow (in a similar fashion to the U.S. Navy Zumwalt-class destroyer or the French Navy next generation of frigates). Inverted bows maximize the length of waterline and hence the hull speed, and have often better hydrodynamic drag than ordinary bows. On the other hand, they have very little reserve buoyancy and tend to dive under waves instead of piercing or going over them. It is fitted with two shaft lines and two rudders. The images show three ISO containers on deck. The design is fitted with stern doors probably to launch and recover smaller USVs or UUVs. The Medium USV can extend the eyes and ears of the Fleet for detection and surveillance trough many onboard systems. The U.S. Navy is moving forward with plans to design and develop large, medium and small size USVs to support operations in blue and littoral waters. Rear Admiral Ronald A. Boxall, Director of Surface Warfare OPNAV N96, said during I/ITSEC, a training and simulation conference held last month in Orlando, that the focus of his command will be to pack more sensors and weapons into surface vessels so a smaller number of larger vessels can act as command and control for smaller unmanned vessels.